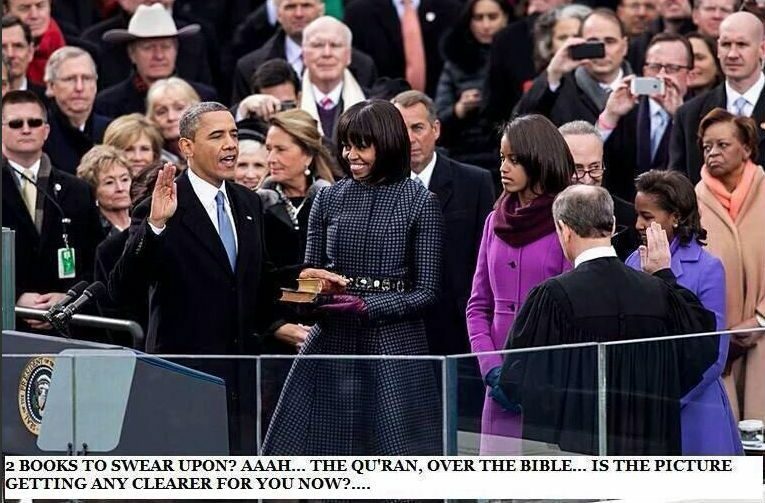 FACT CHECK: Did President Barack Obama Take the Oath of Office on the Quran? Only in the fake news universe could two historical Bibles be confused with a copy of the Quran. A photograph shows President Obama taking the oath of office with his hand on a Quran. President Obama is putting a symbolic twist on a time-honored tradition, taking the oath of office for his second term with his hand placed not on a single Bible, but two — one owned by Martin Luther King Jr. and one by Abraham Lincoln. The inclusion of King’s Bible is particularly significant since the inauguration comes on Jan. 21, the federal holiday in honor of the civil rights leader, who delivered his “I Have a Dream” speech 50 years ago at the Lincoln Memorial. Obama will be facing the memorial as he takes the oath. King’s Bible, which his children say he used early in his career as a preacher, has never been part of a presidential inauguration. Though there is no constitutional requirement for the use of a Bible while taking the oath, George Washington began the tradition with a Bible hastily grabbed from St. John’s Masonic Lodge No. 1 for his swearing-in on April 30, 1789, in New York. Since then, presidents have typically chosen Bibles with historical or personal significance, many using family heirlooms. Obama is not the first president to select two Bibles — Harry Truman did so in 1949, Dwight Eisenhower in 1953 and Richard Nixon in 1969.